Mohammad Ramzan, a 78-year-old frail man, is the first person to arrive outside the business unit Parimpora of Jammu and Kashmir Bank Ltd. Wrinkled face, sunken eyes, chronic cough, stinking clothes and a bank passbook is the permanent feature of this old man’s journey of last one year. He visits this branch everyday to check his account balance. A resident of Barthana in Qamarwari, Ahad’s only income is the old age pension of few hundred rupees per month. Survived by his wife, 74-year-old Mughli, Ramzan’s two sons have left him in lurch after getting married. With pension and help from a few locals, Ramzan used to manage his life with intermittent difficulties. He had also turned his small patch of land into kitchen garden. The produce of which, most often, would go in his kitchen. Then came September 2014 floods. His one storied house was submerged along with his household items. When the water receded, Ramzan along with his wife returned to see the wet and weakened walls, dampened floor and stinking environs. The garden turned into heap of mud. Pension continued, but the shelter was lost. Ramzan, like many others was shattered. With government announcement of relief, he rushed to Tehsil office and completed the requisite formalities. Though the announcement of relief amount was made according to the extent of damage, Ramzan got a cheque of Rs 3800 only. Since then he visits bank everyday to check balance of his account. The only answer he gets is ‘Winn chuv neh woathmut (It is yet to come). On many occasions, bank officials contributed money for him from their own pockets. Ramzan and Ajaz represent hundred of people on each side. In fact this is how the relief distribution took place. The victims allege that the cheques of Rs 75,000, Rs 12,500 and Rs 3,800 were distributed, but to influential people under undue relief. “There’s not only discrepancy in the distribution of cheques but also in the amount sanctioned. Some of the houses which were not fully damaged have been given Rs 75,000 whereas poor people have been left to fend for themselves,” said Muhammad Maqbool, a resident of Karan Nagar. Though government constituted special teams to assess the damage, but victims alleged that there was selective approach. Reportedly revenue officials used to sign the cheque book in advance and names were written by the ‘brokers’ from whom they collected money. “In many cases father and son were given two relief cheques despite living together in one house,” a fresh recruit Pathwari told Kashmir Life on condition of anonymity. There are allegations that the list of flood victims included households which were not hit by the floods. For instance, Abdul Aziz of Chattabal has received Rs 12,600 cheque from Tehsildar duly credited in his account. 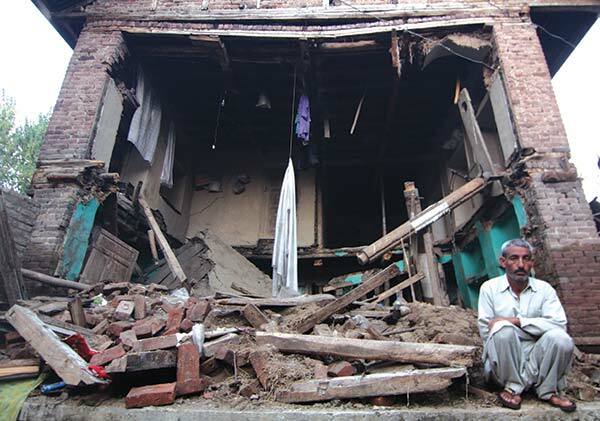 Aziz’s house was not hit by floods and also prior to floods he had shifted to his new home in Lal Bazar. This according to observers led to denial of rights to genuine victims. “See might and muscle influenced the cheque distribution. The uninfluenced lot suffered,” said Abdul Basit of Mehjoor Nagar.